I have to admit to a cheeky takeaway every now and again, but whilst they always leave me feeling bloated and sluggish, this take on a classic is actually really good for you and really easy to make; it's my brother's meal of choice the night before a race, and if it's good enough for elite level triathletes, it's good enough for me! If you're vegetarian you could obviously switch the chicken out with Quorn or another meat substitute, or leave it out altogether and throw in extra vegetables - baby sweetcorn is really nice! This recipe serves three, so we normally have it for dinner and then boyfriend has the leftovers reheated for lunch the next day. Start by dicing two large chicken breasts and frying in 1tbsp olive oil over a low heat for about ten minutes, until lightly browned. Remove from the pan and keep warm, then fry one diced onion, one sliced pepper and one carrot cut into sticks in another tbsp olive oil until soft - about ten minutes. Add four chopped pineapple slices (from a tin), plus 450ml water, 1tbsp white vinegar, 3tbsp tomato ketchup, 2tbsp syrup from the pineapple can, the juice of half a lemon (or 2tbsp if using shop-bought juice) and 25g sugar. Simmer for about 15 minutes, or until reduced by half. Return the chicken to the pan. In a small bowl, mix 1tbsp of cornflour with 2tbsp cold water, then stir through the sauce to thicken it, continuing to heat for a few minutes. Serve over boiled rice or, if you're feeling fancy, you could make egg fried rice! 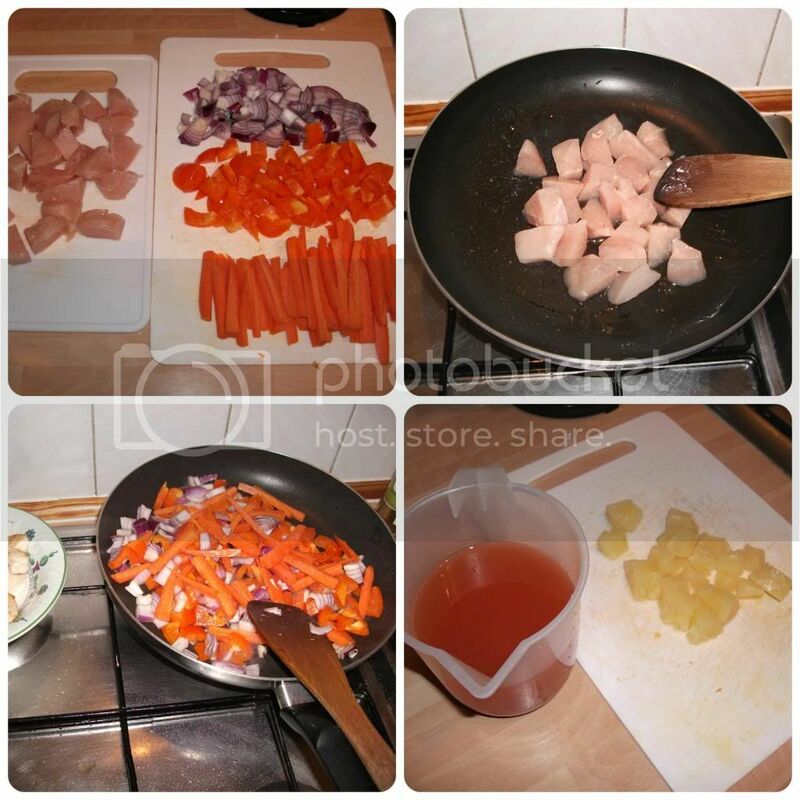 Do you like to make at-home versions of your takeaway favourites? Will you be trying this one? Let me know if you do! 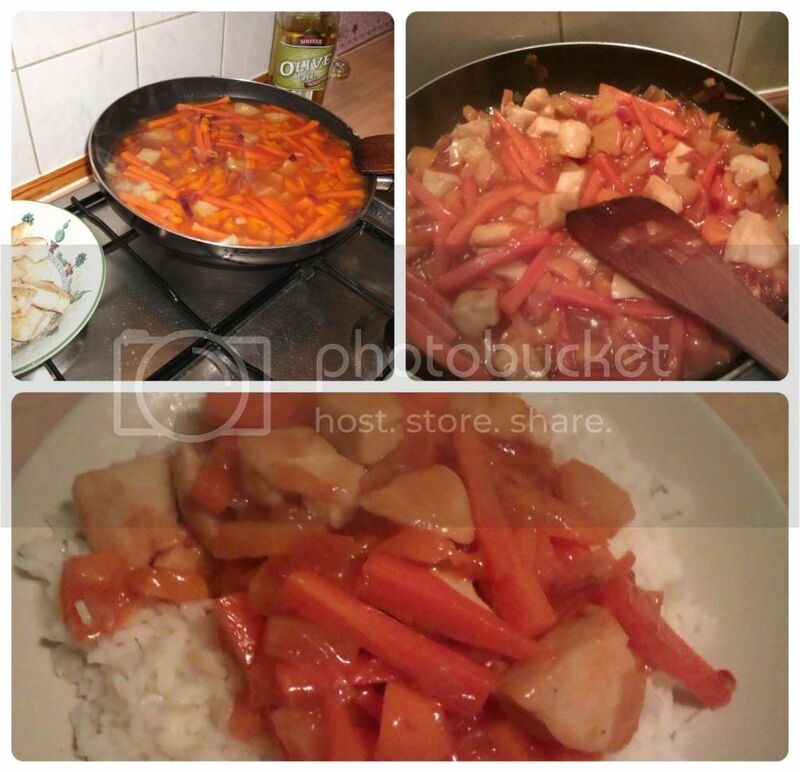 I've been wondering about trying to make some sweet and sour - we just use one out of a packet atm, but seeing I make the rest of my curries from scratch it's about time I tried to make this the same way. I'll have to give it a go!